When members of the military are deployed overseas, they need to make arrangements about a number of issues before they leave. One worry they shouldn’t have, however, is care for their pets while they are gone. Dogs on Deployment, a national nonprofit organization, provides an online network for service members to find volunteers who are willing to board their pets during their deployment. In addition to helping military personnel find volunteer boarders, the organization provides them with peace of mind during their service commitments and resources to help them. To promote responsible pet ownership, Dogs on Deployment helps military members cover the cost of pet care during emergencies before and during deployment. The nonprofit provides military members with resources about responsible pet ownership and connects with community organizations to ensure that Dogs on Deployment resources are available to military families. The organization also offers financial assistance to get military pets spayed/neutered, vaccinated and microchipped. Dogs on Deployment was founded in 2011 when a dual service couple, Alisa and Shawn Johnson, received simultaneous military orders. When they realized that no one could care for their dog, they decided to start an organization that would connect military members with volunteers who are willing to board their pets during service commitments. According to the organization, volunteer foster homes are available in all 50 states and military members should be able to find a boarder within 50 miles of the base where they are stationed. As of early 2016, almost 900 military pets have been placed in foster care, and more than $200,000 has been awarded to military families in need. Dogs on Deployment sponsors directly affect military members and their pets by improving morale, stability and overall livelihood. For more information, visit dogsondeployment.org. Published on October 30, 2017 in Community Groups in Action and tagged none by Kristy Johnson. New York Times bestselling author John Grisham’s newest legal thriller, The Rooster Bar, released October 24, takes you inside a law firm that shouldn’t exist. Mark, Todd and Zola came to law school to change the world, to make it a better place. But now, as third-year students, these close friends realize they have been duped. They all borrowed heavily to attend a third-tier, for-profit law school so mediocre that its graduates rarely pass the bar exam, let alone get good jobs. And when they learn that their school is one of a chain owned by a shady New York hedge-fund operator who also happens to own a bank specializing in student loans, the three know they have been caught up in The Great Law School Scam. Published on October 30, 2017 in Literary Loop and tagged front by Kristy Johnson. Family: My wife, Paula, and our two cocker spaniels, Teddy and Harvey. The rest of my family lives in Germany, where I am from originally. Why I’m Passionate About What I Do: I truly believe that music can make us better human beings. Experiencing a concert together can connect total strangers in a shared experience – a shared emotional experience that may range from the melancholy to the exuberant. In a time of virtual realities, these are true social connections that create empathy for our fellow humans. Community Groups and Charities I Love to Support: I like good journalism, and I like classical music. Therefore, National Public Radio and several of its classical music member stations are always on top of my list. In addition, both Paula and I are passionate about the enormous problem of plastic pollution that our modern world faces, and so we like to support environmental causes that focus on this issue. Biggest Career or Life Obstacle I’ve Overcome and How: I think the biggest obstacle in the career of a conductor is the huge amount of rejection that one experiences over the years. This is mostly because the competition is so enormous. For any job that we apply for, there are usually 200-plus applications. The one and only way to deal with this problem is persistency. I have managed to ignore, or at least blend out, the endless stream of rejection that conductors will experience during their careers: be it from people who are questioning their talents, from losing out to competitors whose main qualification is “who they know,” or from the countless rejection letters that I have received over the years. No matter how personal each one of these might feel, you have to just get up and try again. Accomplishment I’m Most Proud Of: To be where I am today. When I started out, all I was hoping for was to somehow get paid for making music. Today, I am the music director of two professional orchestras and a professional opera company. I never would have dreamed this to be possible. What Your Childhood Self Wanted to Be When You Grew Up: For a brief period, I was following every boy’s dream of being an astronaut or an airplane pilot. But then I decided pretty early on that I wanted to be a conductor. By the time I was a teenager, I knew that’s what I wanted to do. Favorite Way to Spend Saturday Afternoon: Cueing up my German Bundesliga and watching my favorite soccer teams with my dogs. Dream Vacation: Exploring the cities, countrysides and culture of Indonesia and Bali. I find this part of the world fascinating and extremely beautiful. I have been to Thailand and Malaysia, but I have never been to this group of islands, and I hear it is amazing. Something That Has Changed My Life: Not something, but someone: My wife, Paula. Best Thing I Ever Learned: If you truly belive in something, you can make it work. Favorite Hobbies: I love to cook, and I love to travel. Secret Aspiration: One of these days I would love to get my pilot’s license. Something People Would Be Surprised to Know About Me: When I was 19 years old, my hair was shoulder long and I played lead guitar in a heavy metal band. What person do you think we should know? If you’d like to suggest someone we should meet, email editor@columbiacountymag.com and tell us why. Published on October 30, 2017 in P.Y.S.K., People and tagged front by Kristy Johnson. There’s no disguising a lifelong love of Halloween – or a weakness for witches – in this West Lake home. Ever since she was a little girl, West Lake resident Debbie Clark has loved Halloween. The party has continued into adulthood for Debbie, and her family and friends have joined in the fun along the way. Every year Debbie decorates her home, where she and husband Lee have lived since 2003, with Halloween decorations that she has accumulated for 30 years. Surrounded by witches and pumpkins and candy corn every October, Lee has no choice but to love the holiday. And Debbie can decorate with no double, double toil and trouble because Lee has one job to perform each year. “He brings all the stuff down from the attic and puts it back up in the attic,” says Debbie. Evidence that the Clark residence is a happening Halloween house is apparent before anyone even steps foot inside. Two pumpkins sit on the brick front porch, where a quartet of witches could hold a convention on four black rocking chairs. One pumpkin rests beside a witch while the other sits next to a trio of black cats. Six white columns stand in a row along the porch, but one of them is the true marker that Halloween has arrived at the Clark house. The column is the landing spot for a gray-haired, black-clad, pointy purple-hatted, broom-riding witch that has crashed into it. Healthy ferns – that look as if they have been fed a magic potion to help them grow – spill out of the sides of two black planters, which could double as cauldrons for a witch’s brew. Across the threshold through the front door, even the pumpkins dress up for Halloween. At the foot of the stairs, two pumpkins clad in wedding attire greet guests. The “bride” wears a white veil and a white boa while her well-dressed “groom” sports a black top hat and black bowtie. Spider “rings” dangle from each of their hands. Debbie put the bride and groom pumpkins together for a fall wedding shower for a friend’s daughter, and they fit in perfectly with her décor. The faceless couple are typical of the pumpkins – not jack-o’-lanterns – around the house. “I can sew a costume, but I can’t carve a pumpkin,” Debbie says. In the dining room, the table features an orange polka-dotted table runner underneath a shorter runner with spider webs on either end. A pair of black, oversized witch’s shoes filled with burlap, gourds and pine cones serves as the centerpiece. Debbie really takes those words to heart. Every October she has a Halloween costume party for the women in her neighborhood bunko group. On a small chest, ghost and witch candles keep a close eye on all of the Halloween happenings around the house. The candles are nestled in gobs of candy corn that fill clear candleholders of all sizes. Showing her practical side, Debbie saves the candy corn from one year to the next. On the opposite side of the room, a three-tiered stand is covered with Halloween petit fours. Round orange pumpkin petit fours are mixed together with square cakes with white icing that are decorated with ghosts or pumpkins. A collection of witches can be found throughout the house – Debbie has a thing for witches – and her favorite decoration is a papier mache witch stationed by the fireplace in the den. 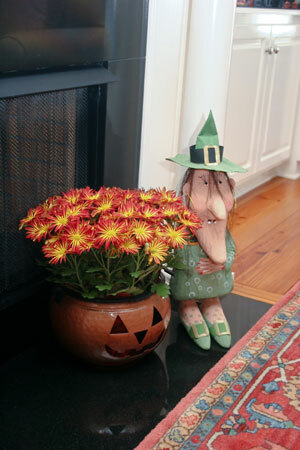 A jack-o’-lantern planter filled with spider mums sits next to the witch, which is dressed in green from her pointy hat to her pointy shoes. Witch legs clad in silver-and-black-striped stockings and red heels poke out of two black cauldrons on the mantel, and an orange grapevine wreath, topped with a purple witch’s hat, occupy the center of the mantel. 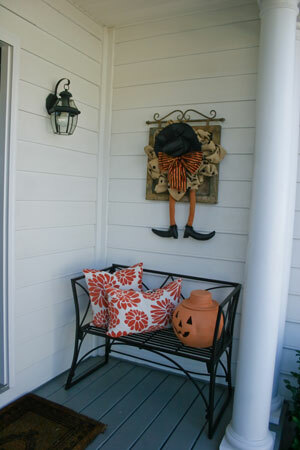 A cluster of black or white painted pumpkins, decorated with polka dots or stripes, is grouped in front of the wreath. The den features hardwood flooring and built-in bookcases on either side of the fireplace. Using a bit of Halloween sorcery, Debbie wrapped orange netting around a stand that she topped with a witch hat and placed on the bookcase. “I thought the stand was kind of ugly, so I just wrapped it to make it look a little better,” she says. Gold pumpkins line the top of a secretary, and a Department 56 Halloween village is set up on the writing area of the secretary. Another witch, which was given to Debbie by a friend, dangles from the ceiling fan chain. Small orange, black and white painted pumpkins, also adorned with stripes and polka dots, fill a big bowl on the round glass coffee table in the den. In the adjoining kitchen, which features granite countertops and hardwood flooring, a two-tiered stand on the counter is full of gourds. Orange pumpkins are scattered around the kitchen as well, and two wine bottles clad in witch and ghost costumes stand sentry on a side counter. Of course, since Debbie has her practical side, the kitchen isn’t as decorated as the rest of the house. “I can’t work around all my decorations,” says Debbie, who likes to cook. 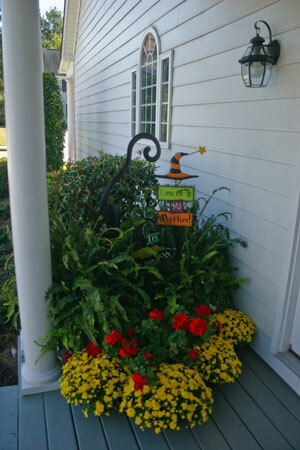 And one of Debbie’s favorite thing about her Halloween décor is that it doesn’t have to be expensive. She gets a lot of her decorations from discount stores, and Fat Man’s was one of her favorite haunts back in the day. “I’m always on the lookout for things,” she says. “I started with it because it can actually be tacky, and it’s OK. It doesn’t have to be perfect. Published on October 13, 2017 in Home & Garden, In The Home and tagged none by Kristy Johnson. Place graham crackers in a food processor and process until fine crumbs. Empty into a medium bowl; add sugar and 6 tablespoons melted butter. Mix well. Press crumb mixture onto bottom of a 9-inch spring form pan. Chill 5 to 10 minutes in the freezer until set. Peel, core and slice apples. Sauté in 2 tablespoons butter over medium heat 4-5 minutes until cooked through; set aside to cool. In a separate bowl, beat cream cheese and sugar until smooth. Gently stir in the apple pie filling and whipped topping. Spread over the prepared crust. Spoon caramel sauce evenly over top of cheesecake. 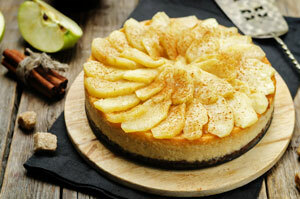 Garnish with cooked apple slices in a pinwheel pattern. Refrigerate 4 hours or until set. Lightly garnish with cinnamon before serving. Published on October 9, 2017 in Desserts. The 2017 Major League baseball season may be winding down, but it got off to a pretty good start for Washington, Georgia resident Marvin Hudson. He had the best spot in the house as the home plate umpire at the Atlanta Braves’ opening game in the team’s new Sun Trust Park. If the start of this season was auspicious, however, then the end of last season was even better. Hudson was the third base umpire in the deciding seventh game of the 2016 World Series when the Chicago Cubs ended a 108-year drought to win the Fall Classic by defeating the Cleveland Indians. It may not have taken the 53-year-old Hudson, who became a Major League umpire in 1999, quite as long as it took the Cubs, who until last year had not won a National League pennant since 1945, to make it to the World Series. And he didn’t have to contend with years of frustration, the curse of the Billy Goat and an infamous foul ball that haunted Cubs fans for decades. However, the thrill of reaching the pinnacle of his profession – and sharing it with those who matter most to him – was just as real for Hudson. Hudson was one of four members of the seven-man crew that was umpiring a World Series for the first time. While he was in an exclusive club with his Fall Classic assignment, the nature of his job puts him in a small coterie of professionals as well. Hudson is in a select fraternity of only 76 Major League umpires. Each year more than 300 prospects try out for the coveted positions. “Few slots are available each year because of the low turnover rate, and some veteran umpires may serve 30 years or more,” Hudson says. The prospective umpires are under strict scrutiny by their superiors and Major League Baseball. Each pitch in every game is recorded, and umpires are graded as to whether they miscalled a ball or a strike. The former baseball player for Piedmont College, where he was inducted in the Demorest, Georgia school’s Sports Hall of Fame in February, decided to become an umpire at the urging of his friend, Doc Sisk. After Sisk encouraged him to try his hand at calling games, Hudson enrolled in professional umpire training school. Minor League Baseball Umpire Development has approved the curriculum for two training schools, which run for four to five weeks in January and February each year. Hudson finished umpire school at the top of his class, and his first professional assignment came in the Appalachian League in 1992. He continued to pay his dues by calling games in the South Atlantic, Florida Instructional, Southern, Hawaii Winter and International leagues before breaking into the Majors in 1999. Most umpires spend seven to 10 years in the minor leagues – twice the amount of time it typically takes a baseball player to make his way through the ranks – before getting called up. During training, instructors evaluate potential umpires on much more than their knowledge of baseball rules. Umpires must exhibit traits such as confidence, a strong presence on the field, knowledge of mechanics (where to go when the ball is hit), forceful calls, effective use of voice, hustle, character, good judgment and the ability to handle situations on the field. 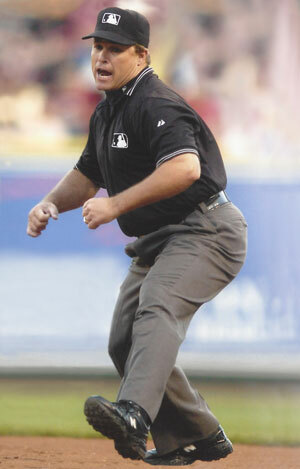 In short, baseball umpires must be able to represent the integrity of the game. Umpires need to develop a thick skin – and decide just how much they’re willing to tolerate from players, managers and fans – to perform their duties as well. Hudson once tossed an unruly fan out of the stadium during a Southern League game in Memphis. He had words with the Washington Nationals’ outfielder Bryce Harper and manager Matt Williams about a called strike before ejecting them in the third inning of a 2015 game against the New York Yankees. 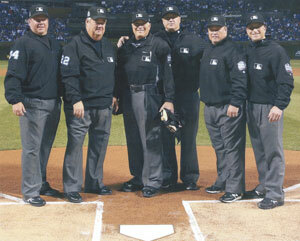 Umpiring in the Major Leagues is much more than calling ball or strike, fair or foul, safe or out, however. At training school, professional umpires also are taught how to conduct themselves on and off the field. And some of those off-field attributes translate into charitable work. Hudson serves as vice president of the board of directors of UMPS CARE, which provides financial, in-kind and emotional support for America’s youth and families in need. His wife serves on the Volunteer Wives Committee. The mission of UMPS CARE is to put its creed – “Helping People is an Easy Call” – into action. The professional umpires enrich the lives of at-risk youth and children coping with serious illness by providing them with memorable baseball experiences. Through scholarship initiatives, the organization also offers financial support to children adopted later in life and to current and former members of the military. Having the opportunity to make a difference in the lives of others – as well as the chance to wear a Major League umpire’s uniform – have made the endless travel, grueling schedule and low pay in the minors all worthwhile. With patience, perseverance and focus on his goal, Hudson has achieved his dream. Published on October 1, 2017 in Sports and tagged front by Kristy Johnson. From the author of the #1 international best seller The Girl in the Spider’s Web, comes the newest book in the Millennium Series — The Girl Who Takes an Eye for an Eye by David Lagercrantz. The series began with the late Stieg Larsson’s The Girl with the Dragon Tattoo. Even Lisbeth Salander, the girl with the dragon tattoo — the brilliant hacker, the obstinate outsider, the volatile seeker of justice for herself and others — has never been able to uncover the most telling facts of her traumatic childhood, the secrets that might finally, fully explain her to herself. Now, when she sees a chance to uncover them once and for all, she enlists the help of Mikael Blomkvist, the editor of the muckraking, investigative journal Millennium. And she will let nothing stop her — not the Islamists she enrages by rescuing a young woman from their brutality; not the prison gang leader who passes a death sentence on her; not the deadly reach of her long-lost twin sister, Camilla; and not the people who will do anything to keep buried knowledge of a sinister pseudoscientific experiment known only as The Registry. Once again, Lisbeth and Mikael, together, are the fierce heart of a thrilling full-tilt novel that takes on some of the most insidious problems facing the world at this very moment. Published on October 1, 2017 in Literary Loop and tagged front by Kristy Johnson.